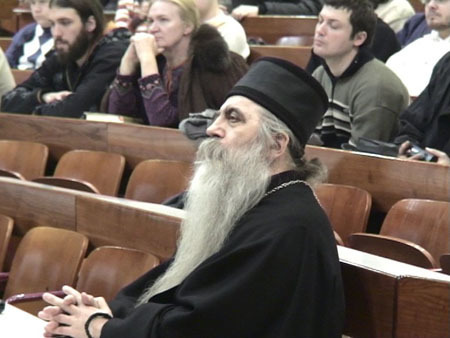 Belgrade, Serbia - During his visit to Serbia, Father Gerasim, abbot of the Monastery of St. Herman of Alaska in Platina, California, visited our Theological Faculty and presented a lecture in the amphitheater entitled: “How One American Views Orthodoxy”. 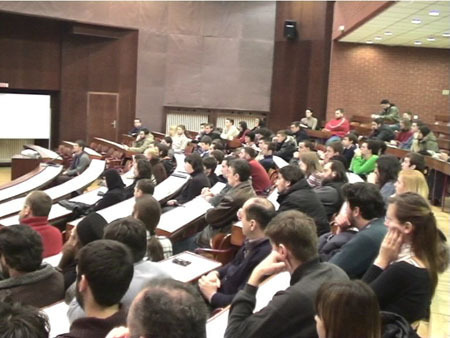 The lecture was attended by the dean of the school, Bishop Dr. Irinej (Bulovic), Bishop Maxim (Vasiljevic), the diocesan hierarch of the abbot as well as guide through Serbia, and other lecturers from the school. Fr. Gerasim (in the world Gordon Eliel) abbot of St. Herman's Monastery, is known throughout Orthodox America. The monastery, which has some fifteen monastics, represents a phenomenon in America's cultural-religious context. the aforementioned way of life, the Typicon, order of services, and so on. Following the example of St. Herman, inspired by his missionary zeal, the monastics in Platina consider missionary work a part of the very nature of the Church. They make every effort to stop Orthodoxy from being “the best kept secret in America” (as it is humorously referred to). And so they have started missions in Alaska, South America and even in China. The monastics at St. Herman's Monastery serve as the most significant support to the life of the Western American Diocese. They witness their authentic and energetic monasticism and therefore they are the essential element of a healthy church life. Their help comes from the simple fact that they exist but also through their publishing activities. Each year they publish certainly the most expansive Calendar which includes all known saints of the Church. In his inspiring lecture, Fr. 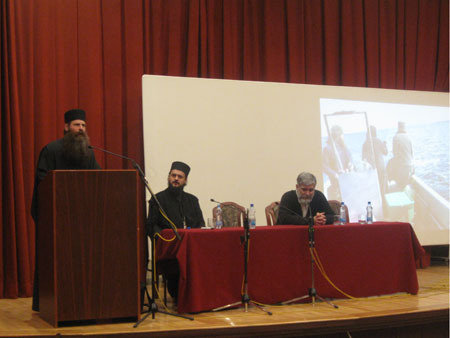 Gerasim spoke of the many visible signs of the presence of Orthodoxy on the North American continent.